Reality Check: Where is the plastic waste mountain? In recent years, the UK has heavily relied on China to take our unwanted plastic packaging. Three years ago, the UK was exporting half a million tonnes of plastic to China and Hong Kong - accounting for almost two-thirds of all our plastic sent abroad. China introduced its ban on "foreign garbage" as part of a move to upgrade its industries 12 months ago. At the time, the UK recycling industry warned that the decision would be a "game-changer" and that it would be a struggle to deal with the country's waste. Well, it hasn't appeared - partly thanks to other countries taking our waste plastic instead, and partly because we are burning more of it. It's clear that other countries have imported much of the plastic packaging previously reprocessed by China. The fact is we can't be certain from the data what exactly has happened to the shortfall. Well, where there's waste plastic there's potentially profit - because some of it can be lucratively recycled. So some nations have geared up their reprocessing plants to welcome our waste with open arms. Poland is in third place on the league table - although it actually received slightly less UK plastic in 2017-18 than it did in 2016-17. It's not clear why. In fourth place is Indonesia, which along with Malaysia, Thailand, Vietnam - is in the top 10 for the quantity of waste plastics polluting the ocean. On this measure, Malaysia and Turkey remain at the top while Indonesia stays in the top five. The new entries (replacing Poland and the Netherlands) are Spain and France. Spain recorded an increase of 14,000 between 2016-17 and 2017-18, and France was just behind on 9,000. Of course, sending material abroad for recycling doesn't necessarily mean it actually gets recycled. Waste firms in the receiving country may sift through the rubbish, take out the economically valuable material and burn or even dump the rest. The waste industry is notorious in some places for its links with criminal activity. The global illegal waste trade is estimated by the UN to be worth between £8bn-£9.5bn a year. Since China's ban, Malaysia has seen a big surge in the amount of plastic it has received from abroad, including from the UK. "Malaysia is not able to process all of the imported waste, there are limited plastic waste factories", says Mageswari Sangaralingam who works for the Consumers' Association of Penang and for Friends of the Earth, Malaysia. 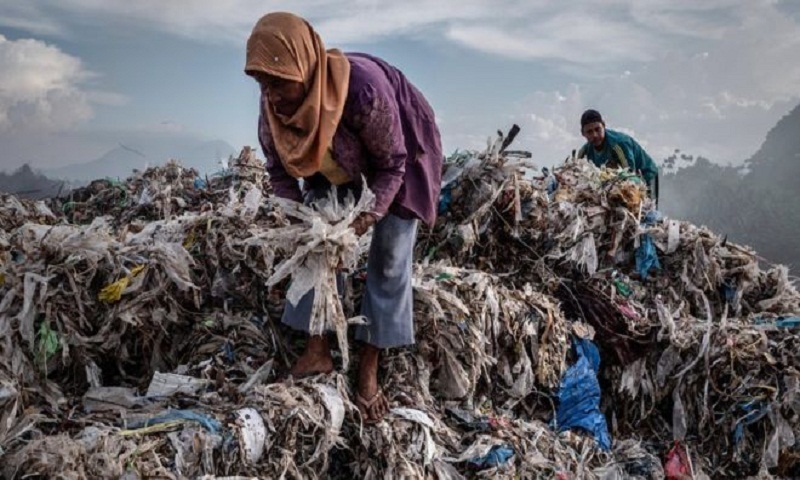 According to Ms Sangaralingam, not only is Malaysia receiving more plastic than it can properly dispose of, some of it is low-grade which ends up as landfill. There are also some rogue recyclers who, she says, burn plastic in the open - leading to environmental harm. The Malaysian government has announced stricter conditions on the import of plastic and says it wants to phase it out over the next three years - but Ms Sangaralingam wants an immediate outright ban. "Malaysia is not a dumping ground and hence should stop importing plastic waste," she says. What's the UK doing about the issue? "The export of plastic waste is out of the control of the industry and the BPF is particularly concerned about recent reports of illegal and fraudulent exports of plastic packaging waste routed to Asia through Holland." The BPF also told us it would support a global accreditation system for the waste export sector and that recycling should be done at home. Environment Secretary Michael Gove says the UK must stop "off-shoring its dirt". We asked the UK government why it didn't simply ban the export of waste plastic. We were told that while the UK was committed to "recycling more at home" there is a "legitimate export market for plastics particularly for countries that manufacture new products out of recycled plastic waste". Mr Gove wants to stimulate more recycling, but UK firms wanting to process more waste in Britain complain it's hard to get funding. "There are very few countries left where we can comfortably export to and the market is shrinking," warns Simon Ellin, chief executive of the UK Recycling Association. "People don't want to buy this material, so where on earth is this all going to go?" he adds. "We're almost at a crisis point, unless we get a plan quickly," he says. Overall recycling figures have stagnated and some councils are burning 80% of all residual waste, including recyclable plastic and paper. In the 12 months to March, 50 of 123 councils incinerated more than half the household rubbish they collected, including plastic and paper, official figures recently revealed. The worst are in London. Westminster burned 82% of all household and recyclable rubbish. Less than half of all household waste (45.2%) was recycled in 2017 - a minuscule rise of just 0.3% on the previous year. The UK now seems unlikely to reach the EU-enforced target of 50% recycling in the next two years. The Western Riverside Waste Authority, which covers Hammersmith and Fulham, Kensington and Chelsea, Lambeth and Wandsworth, incinerated 79% as did Lewisham and Tower Hamlets. Slough, Kirklees, Sunderland, Portsmouth and Birmingham councils all incinerated at least 70% of all plastic, paper and household rubbish. Swindon Borough Council said in November it wants to burn plastic along with other rubbish rather than sending it abroad for recycling - saying some "isn't properly recycled". Analysis by the BBC suggests that recycling rates are being hindered by the myriad of different rules which are in play up and down the country. It found that nearly half (47%) of Britons asked said they disagree about what should and should not be recycled. Claire Shrewsbury, from the recycling body Wrap, told BBC News: "The time has come for the UK to take more responsibility for its own recovered materials, and move towards a circular system for plastics and other materials. "There is a global market for high quality resource exports to countries that manufacture products, and this is something the UK should explore. "This will require fundamental change from all of us. And that means regulatory transformation, collaborative industry action, together with citizen behaviour change." Ms Shrewsbury aims her comments at anyone who buys stuff and throws packaging away. Reality Check: Is Beijing's air quality better this winter?